Guardrail, bollards, safety railing, and other safety equipment are all designed to protect people and property from dangerous and costly accidents. The S. W. Betz Company is committed to ensuring that your facility is as safe as it can be. One of the major benefits of different guardrail solutions is a safer work environment for your employees, your machinery, and your products. Heavy-duty guardrail is designed to protect your facility from all types of trucks or lifts, including forklifts. Guardrail is designed to take an impact instead of one of your employees or something in your facility. This safety precaution can prevent injuries to your staff, as well as thousands of dollars in repairs or replacement equipment. The S. W. Betz Company both sells and installs a number of different guardrail and guarding products. Some of these products are listed below. 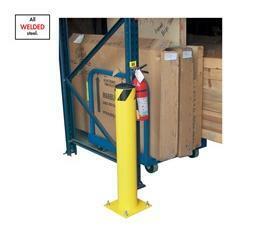 Heavy-Duty Guardrail – Provides key protection against collection accidents (primarily accidents involving forklifts). Rack Aisle Protectors – This safety precaution shields the aisle-ends of your rack from warehouse traffic. Rack Post Protectors – Protects rack frames from collisions. Bollards – Vertical steel cylinder designed to protect equipment and machinery from collision. Pedestrian Barriers and Safety Railing – Create safe walkways for your personnel. Rack Guards – Protect your inventory from falling out of racking and injuring employees and/or damaging the inventory. Safety is the name of the game when it comes to bollards, guardrail, and other collision-prevention equipment for your facility. Not only can it cost you money when things are damaged and need repaired, but you should also strive for a safe workplace for your employees. The S. W. Betz Company distributes these products from some of the top manufacturers in the material handling industry, including Handle-It and Vestil. If you are in need of or would like more information on any of our bollards or guardrail, please contact us and one of our team members will be happy to assist you. For more information about Bollards/Guardrail or any other product or service from S.W. Betz, fill out and submit the form to the right.